The TBS Boar is simply a great knife and is difficult to improve on but, after 9 months of hard work, we believe we have made the ultimate, toughest, hardest wearing and durable Boar yet. This model has come about as we sent models of our knives to members of the British Military Survival Training team for their honest opinion and after putting them through their paces they came back with some feedback. Essentially we were very happy to hear that there wasn't a lot to do as they were very happy with the overall design, cutting ability and comfort in use. They did say that their preference would be for them to be made in Stainless Steel, have a stable hard handle and have a synthetic sheath option. We have chosen to make the Military Model only in Bohlers phenomenal N690 Stainless Knife Steel. N690 is a Martensitic chromium steel with cobalt, molybdenum and vanadium added especially to make hardened cutting tools with excellent edge-holding properties. It was developed for tools and components which can be hardened to very high hardness levels and great corrosion resistance. When fine ground it produces a wickedly sharp edge and will retain that edge far longer than many other steels available on the market today. The 110mm drop point blade has a proper full, ground to zero, Scandi Grind which is not only easy to maintain it is incredibly sharp straight out of the box. It makes for exceptional cutting ability and edge retention and I am certain you will be impressed. The 120mm handle is made from a super hard Canvas Micarta which is really durable, stable and essentially maintenance free. It is, course, shaped to be wonderfully ergonomic just like all TBS Knives. If you want a knife that can be "Rode all day and put away wet" then the Military Model is for you!! We have taken the opportunity with the Military Model to make some upgrades our Multi Carry carry sheath by changing the velcro to double press studs and changing the carry system slightly to make it sit lower on your belt. 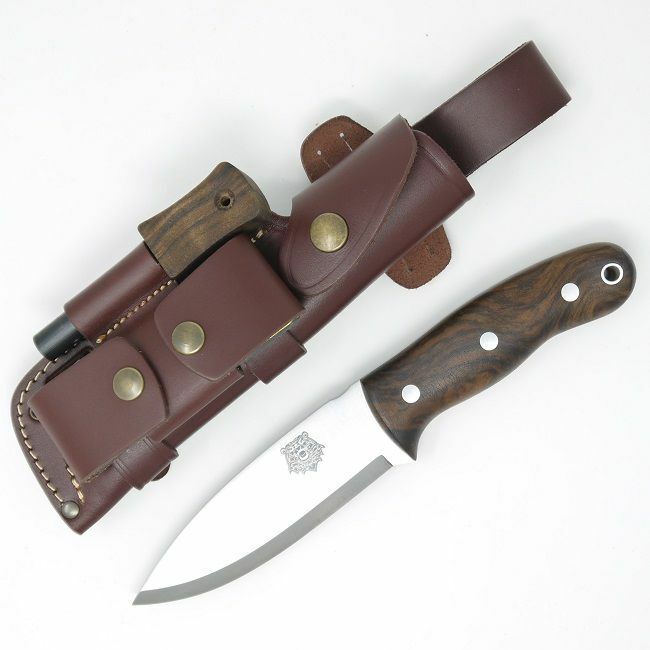 TBS Leather sheaths have been incredibly popular and for good reason. We only use a quality full grain leather (which not everyone does) and this increases the strength and durability of our products. It does make them slightly more expensive but the trade off in longevity far out weighs any false economy of cost saving. Lifetime Guarantee on the knife against any defect in manufacturing, material and workmanship.